Saving your seed packets: how long are they good for? It’s an exciting time of year, not so much in the garden (although I was in mine on Monday, when it was 50 degrees out – seems like a distant memory now!) but inside the gardener’s head, which is full of imaginings of spring, summer, and fall. 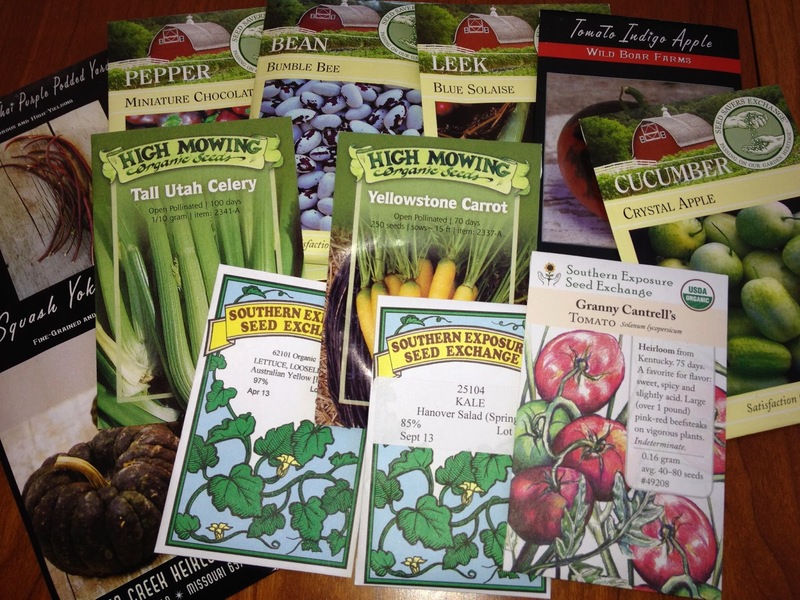 If some of you are sketching your garden bed arrangements, ordering seeds, or even getting a head start on seed-starting, you may be looking at last year’s seed packets and wondering if you can still use what’s inside them. And a post from Margaret Roach’s blog that draws together information from several sources in a chart and points out the disagreements. However, it’s pretty much agreed upon that onion, parsley, parsnip and salsify seeds only last a year, so go ahead and throw those packets away (unless you want to experiment). For the others, you may want to do a viability test, as described in several of the above links. Most instructions for this will tell you to try sprouting 20 seeds between moist paper towels inside a plastic bag, and then decide based on the percentage of successfully sprouted seeds how viable the remainder are. Since I often buy small packets to begin with, I often don’t have 20 seeds left, or don’t want to waste that many (often the viability test has to happen too early in the year for the resulting sprouts to be planted). In that case, I just use 10, or 5, or whatever number I can spare; the viability percentage may not be as accurate, but if they all sprout then you’re good to go, if fewer than half sprout it’s not worth it, and if it’s something in between, it probably is, if you accept you’ll get fewer plants than anticipated. *Mention of specific products, brands, or companies is not intended as an endorsement by the University of Maryland. Well, you took the words out of my mouth! I was just thinking that I should write a post like this and see, there it is. Yep, I have learned the hard way that onion and parsnip seeds are worthless after one year. Bummer, especially for the onion seeds because I always have so many left. Parsley seems to be okay. I know people give very conflicting advice when it comes to spinach. Mane people say you can use it multiple years, but I am starting to think otherwise. Same goes for peppers; 2 years okay, but 3 years most certainly not. Got to love those veggies in the cabbage family: not only do they taste great (in my opinion), but you are really getting your money's worth because those seeds keep for many years! Spinach is debatable, yes. I just sow older seeds thicker and hope for the best. (Onions too, but not as good luck there.) And I've germinated pepper seed that's 5 years old with no problem some years, and other years even brand new pepper seed has problems, so I'm beginning to think it's not the seed! Sorry to take the post out of your mouth! But someone reminded me of the issue weeks ago and here I am just getting to it.